Illustrations of different motion artifacts that affect clarity of moving objects on LCD displays, using the TestUFO Ghosting Test. The UFO objects were moving horizontally at 960 pixels per second on a 60 Hz LCD, and captured using a pursuit camera. Ghosting is a trailing motion artifact. 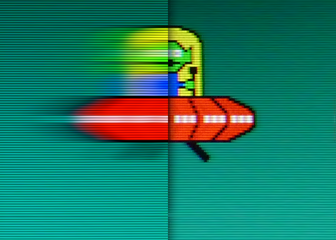 It is caused by asymmetric pixel transitions: Transitions from between two colors can be faster in one direction than the other direction. This motion artifact appears only on trailing edges; observe the yellow dome. Coronas are trailing artifacts caused by response time acceleration (RTC, overdrive, ASUS Trace-Free, BENQ AMA). Pixels can overshoot their final color value before bouncing back, causing bright inverse ghosting. 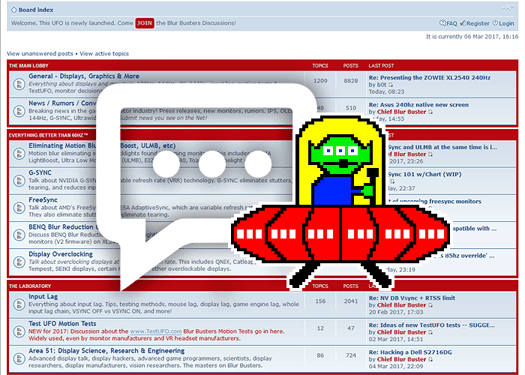 See TFTCentral Overdrive. Motion blur is symmetric for both trailing and leading edges. It is the blurring caused by eye tracking on continuously-displayed refreshes (sample-and-hold). This is not pixel persistence; but a different cause of display motion blur. See Science & References. Higher refresh rates (120Hz) or flicker (CRT and LightBoost) reduce this type of motion blur, see 60Hz vs 120Hz vs LightBoost. PWM artifacts look like repeated images, and can affect motion fludity. PWM represents Pulse-Width Modulation, a technique that many LCD backlights use for dimming screen brightness. Motion artifacts can appear at dim brightness settings. The above photograph was taken during Brightness setting of 0%. See TFTCentral PWM. How Were These Images Captured? Example: Stationary camera photo of a moving object on a display. Pursuit camera are used by display manufacturers for testing (e.g. MPRT pursuit cameras). This is simply a camera that follows on-screen motion. These expensive cameras are extremely accurate at measuring motion blur and other artifacts, since they simulate the eye tracking motion of moving eyes. However, Blur Busters has developed an inexpensive pursuit camera method which operates in conjunction with the Blur Busters UFO Motion Tests. It makes possible accurate photography of motion artifacts. The test at www.testufo.com/ghosting was used to take the pictures on this page. 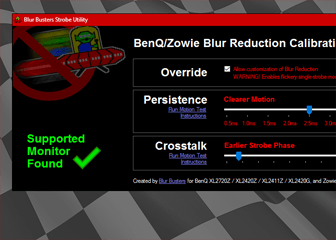 Blur Busters is the world’s first blog to utilize a pursuit camera for accurate capture of motion artifacts, in WYSIWYG format, as seen by the human eye. Can All LCD Motion Artifacts Be Eliminated? 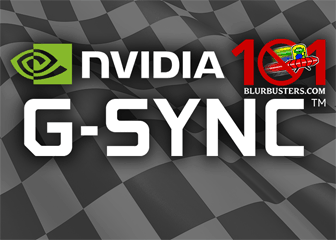 In some cases, nearly all LCD motion artifacts can be reduced by strobe or eliminated by Motion Blur Reduction settings in new gaming monitors such as ULMB or LightBoost. These are strobe backlight technologies now built into modern gaming monitors that can be turned ON/OFF to enable motion blur reduction. 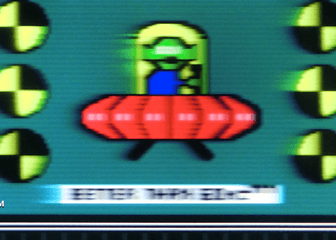 As seen in high-speed video of a strobe backlight in operation, these displays produces CRT motion quality, with all perceptible motion blur completely eliminated. 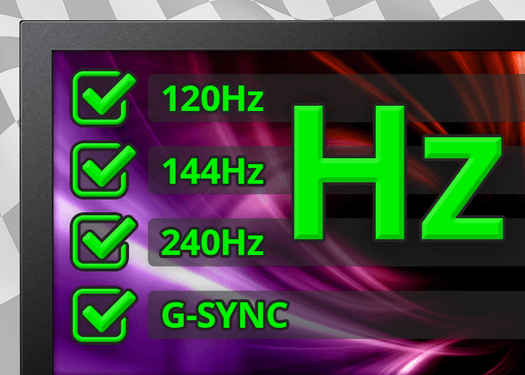 See the next article in this series, LCD Motion Artifacts: Overdrive. Also see Motion Blur Reduction FAQ. The pursuit camera appears to be working well. I wasn’t aware of the PWM artifacts. Post some pics soon. The good news: Any standard off-the-shelf digital camera with manual exposure control! I use my existing Casio EX-FC200S camera (which I also use for my high speed videos) as my pursuit camera. I invented a cheap method of sufficent blogger-league accuracy. Following 960 pixels/sec motion on 24″ monitors at an accuracy of less than 1 pixel error margin. You can even see the LCD screendoor effect isn’t vertically blurred. It is very blogger/magazine/homebrew friendly! In fact, an improved rig could do even better. 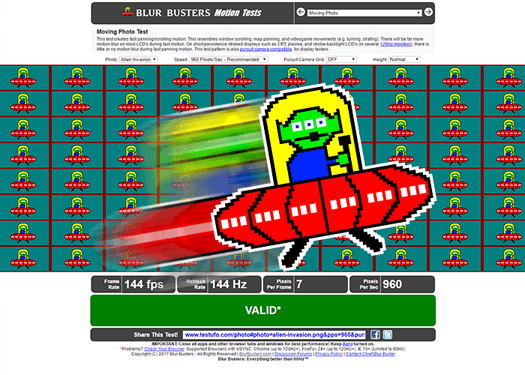 More details to be announced after I launch the new Blur Busters Motion Tests. EDIT: The tracking error margin of the images on this page is about +/- 1 pixel (0.25mm). However, I’ve since made a few tweaks and captured some new pursuit camera photographs, that have less than a 100 micrometer motion-object-tracking error! (camera moving at a speed +/- 0.1mm of the moving object on-screen). This is more accurate than expected. on the vg278h, lightboost on low(10%) it looks great, no motion blur. And maybe use even shorter strobe lengths for even clearer motion than LightBoost=10% while keeping a bright image. Electronically triggered from the pulse from the original LightBoost edgelight, could cause a supercharged LED strobe of 0.5ms; allow clearer than CRT motion.